The breakfast was ok. Not special, not bad. Get there early everything was fresh, wake up late and everything is soggy. we had it both ways. I would like to take a minute to thank one of the servers. Marilyn was exceptionally nice and considerate. Also although unrelated to breakfast, the gentleman who checks on room supplies each day was also extremely kind and helpful. His name is Gregory and he offers sound advice and assistance. Both staffers deserve recognition from the Sagamore, and I hope they are rewarded for the way they work. The room was bigger than I anticipated and a well stocked bar at the kitchen area. The location was superb and was fortunate to stay at the side of the hotel where the noise of the street was calmer. The pool area and access to the beach were excellent. The staff everywhere was very attentive and eager to please. Excellent location right on the beach and on Collins Ave ( easy access to everything shops / restaurants and also the 150 Airport Express stop is 1 minute from reception as is the Free Tram bus stop ). Our Room ( King suite with garden view & balcony) was well appointed and also gave us a view of the beach and the sea. Staff all very helpful. The location could not be any better. Right on the beach and close to Lincoln rd Mall. The heated pool was devine and the outside area was lovely. We had the suite. It was amazing. Comfy, clean, spacious. A lot of room for storing our belongings. Very modern, nice amenities. The beach concierge (older black guy) was awesome and we remembered our name every day. The staff were really friendly. The hotel was VERY centrally centred close to everything including the beach. Good continental breakfast too. I also LOVED the bathroom products...very nice touch. They also allowed us to check in a little earlier than their check in time. Situated in Miami's Art Deco Historic District, this beachfront boutique hotel is a 5-minute walk from Lincoln Road Mall. It features a contemporary art gallery and on-site dining. Each of the modern suites at The Sagamore Hotel includes black and white décor and a whirlpool tub. They are equipped with a 42-inch plasma flat-screen TV and DVD player. WiFi is available. 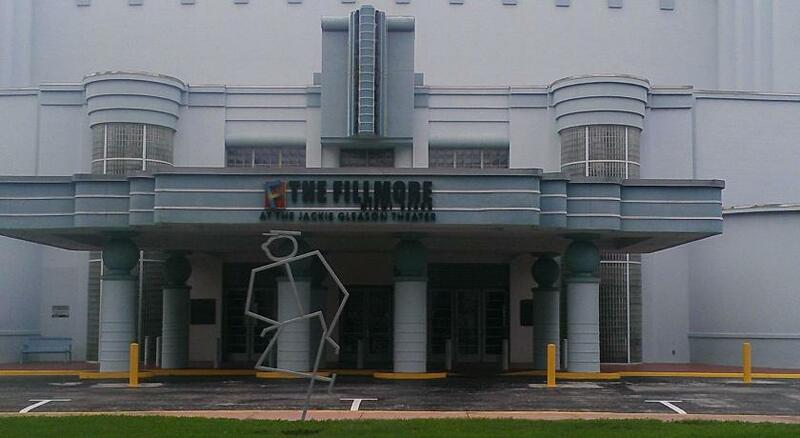 Tours of The Sagamore’s several art galleries are available. 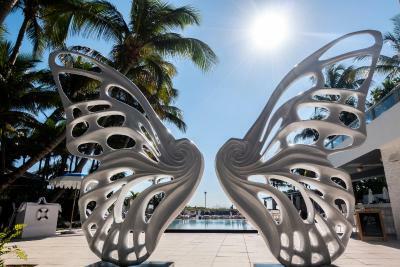 The beautifully landscaped gardens of this South Beach hotel also boast works of art. Offering outdoor seating next to the beachfront pool, the Pool Bar and Grill serves cocktails and American dishes. The art video lounge provides a relaxed atmosphere. The Miami Beach Convention Center is just a 5-minute walk from The Miami Beach Sagamore Hotel. The Bass Museum of Art is 10 minutes from the property by foot. The Sagamore Hotel has been welcoming Booking.com guests since 7 May 2010. When would you like to stay at The Sagamore Hotel? This studio features a kitchenette and a spa bath. This suite features a separate living area, sofa bed, and spa bath. A microwave and small refrigerator are also included. Spacious 2-level bungalow with kitchenette and separate living area. Features a separate living area with a sofa bed and a balcony with ocean views. This suite has a microwave, air conditioning and tile/marble floor. This suite has a balcony, microwave and bathrobe. This suite features air conditioning, tile/marble floor and flat-screen TV. This suite features a balcony, pool view and minibar. This suite has a balcony, tile/marble floor and minibar. This suite features a minibar, tile/marble floor and bathrobe. Welcome to the luxurious Sagamore Hotel, one of the most decadent oceanfront South Beach luxury hotels and a cultural centerpiece in Miami Beach. Located directly on the shores of the majestic Atlantic Ocean in Miami's world-famous Beaches. House rules The Sagamore Hotel takes special requests - add in the next step! The Sagamore Hotel accepts these cards and reserves the right to temporarily hold an amount prior to arrival. Please note a pre-authorisation of USD 150.00 per day will be charged at check in for incidentals. The amount will be released at check-out, subject to a successful damage inspection of the accommodation. Please be advised in the event of an early departure, all confirmed nights will be charged with taxes. Please note that the property has specific package receiving and storage procedures. Contact property for details. 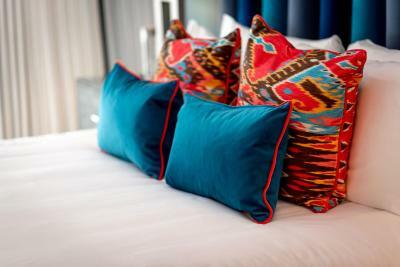 Please note that the property can receive up to 4 guest packages for free. Additional packages may be received for a surcharge. Please note that the property can store packages for free for up to 3 days. Additional storage days are possible for a surcharge. 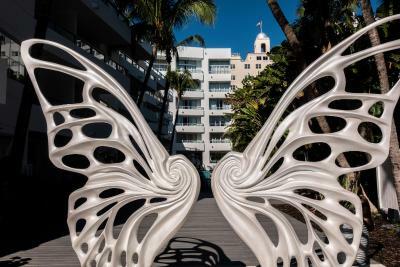 The Sagamore Hotel will be fully activated with events and DJ performances during Miami Music Week from 27 March to 1 April 2019. The Sagamore pool will be closed for swimming and sunbathing after 11:00 each day during this time. Full Beach service will be available throughout the week. DJ sets will take place from 12:00 to 23:00. It would be helpful if there were plates and silverware in the kitchenette. Perfect place to stay for family vacation. Suite was spacious and clean. Pool and beach are top notch. Ideal location. Staff was friendly and helpful. We could walk everywhere. Would love to stay her again!! Although rooms are very spacious, they are looking a little tired and need some updating. We stayed in a King Suite. Location was excellent. Staff was helpful and friendly. Rooms were very large for South Beach hotel. Pool area was great and direct access to the beach with chairs and umbrellas was amazing!! Ocean front. Close to South Beach, Ocean Drive. Walking distance to shopping and restaurants. The art is a bonus at this property. Loved having tile floor in the room. The jetted tub was nice. Pool was warm. Outdated hotel, needs little modernization. Extra beds we had were not in good condition. Best location, has own beach and pool. Could have had better security during spring break. There was an overgrown palm tree that was banging against the bedroom window all night long when it was windy. I did not care for the breakfast - overpriced and the food was cold and trays were empty. Beautiful property with access to beach. Very clean rooms - loved the kitchen area and the suite. The staff was extremely friendly - loved meeting bartender Miguel - he is an asset to your property. Front desk help very efficient. Excellent food and drinks by the pool and on the beach. Staff was attentive and very nice. The room was outdated and wasn't very clean. The service was also really slow when we called and asked for ice. I liked the outside appearance of the hotel. The pool, bar, and facilities were clean and up to date. The room was very sterile. The hallways looked beat up. I liked the outside and the location. the pool was nice. The food was good! I enjoyed the art.